Mastro Geppetto - On Sale! Select NORDINGS - On Sale! Click the "New Pipes" category on the left for great deals! Tim West - All 25% Off! Ramazan Meerschaums - All 20% Off! Click the "On Sale" tab above for great deals! 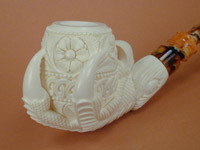 We use the finest Turkish Block Meerschaum available. 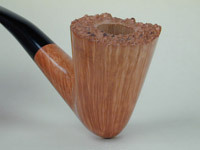 Except for Classic Shapes, the pipe you see is the EXACT pipe you will receive. Classic Shapes may vary slightly from the pipe pictured in dimensions and weight. All pipes are protected by a custom fitted case. Hand-made American & European Briars by respected craftsmen turn each block of Mediterranean briar into work of art. Available in a wide range of shapes & grains that are affordable yet distinctive.